I could leave it at that, post few photos and you’d be salivating while you run to the freezer to see if you have any pork chops you can thaw out. 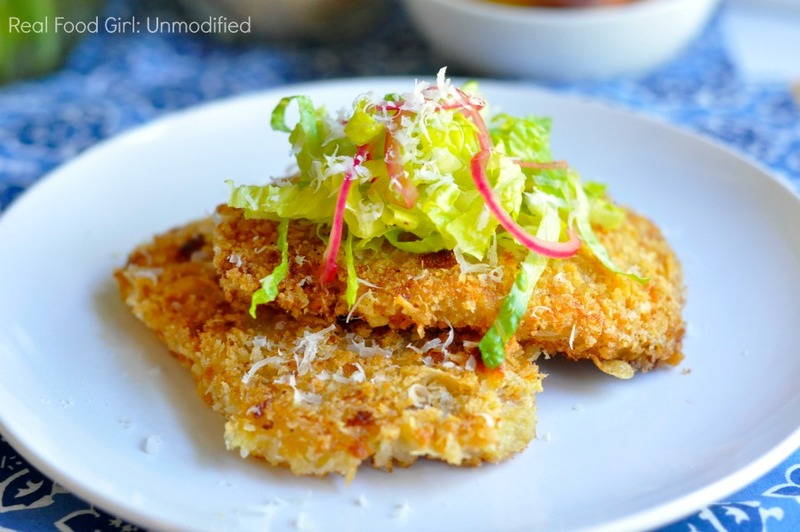 Is there anything better than breaded, pan-fried pork that’s been pounded thin and seasoned just perfectly? Probably, but at the moment I can’t think of anything better. 30-Minute Monday almost didn’t happen this week. Some poor planning on my part left us without the ingredients to make the next dish I had on my list. The recipe, from start to finish took me a wee bit over 30 minutes because I had 8 pork chops to fry (they were small, boneless chops) and I also made some pickled red onions and a little salad with a vinaigrette to go atop the chops. If you skip the onions, the salad and if you don’t fry 8 chops, you should come in at 30 minutes. 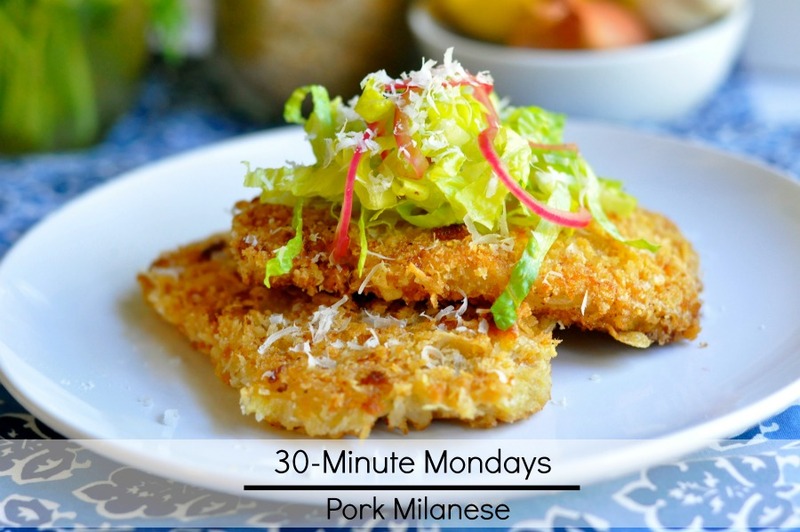 I love Pork Milanese. It’s one of my favorite ways to enjoy pork chops. I don’t make them often, so that when I do, I’ll enjoy them even more. I was going to give you all sorts of great info on Pork Milanese but I’m currently on my 2nd box of Puffs for the day, my nose is raw and my head is pounding. The Stud Muffin mowed the lawn today, and he ended up needing his inhaler and I’ve been blowing my nose and sneezing all day. We even turned the air on and shut the windows and it didn’t help. 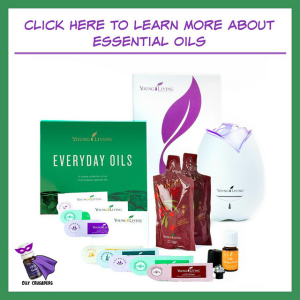 My essential oils allergy bomb diffusing recipe isn’t even helping. When I get like this, my ability to think of clever, educational, helpful things to say goes out the window, so I apologize. Hopefully the photos will speak for me, since I’m unable to. TSM was working up in his den when I was making these, and when he came down stairs for dinner he asked “What is that heavenly smell?” If it makes the house smell good, you know they’re going to taste good. 1 small red onion, sliced into very thin rings. VERY THIN! To make a vinaigrette for a salad, pour 1 TB of the pickling liquid, 1 tsp Dijon mustard and 2 TB red wine vinegar into a small bowl. Add a couple pinches of salt and a pinch of black pepper and whisk to combine. Slowly whisk in 1/3 to 1/2 cup of extra virgin olive oil. Taste and check for seasoning. Drizzle over salad prior to serving. 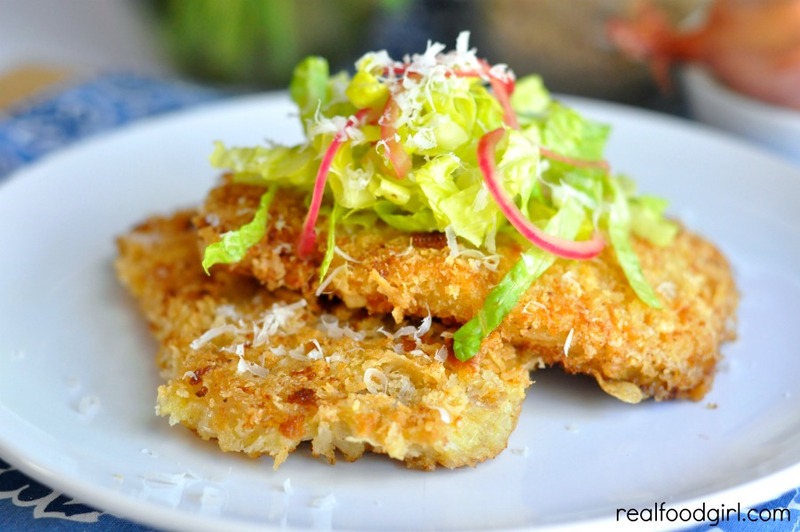 Sprinkle some freshly grated Pecorino Romano cheese atop your salad after it’s dressed. 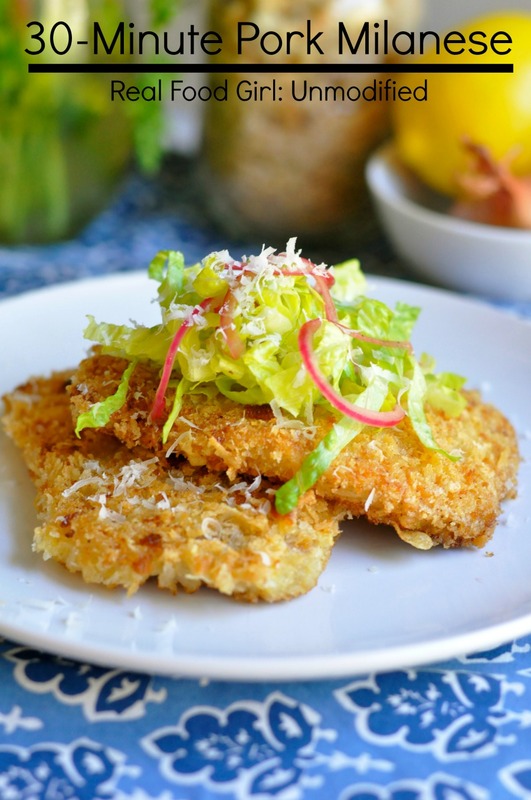 Boneless pork chops breaded with a Panko Parmesan breading and pan fried to a golden brown delicious. One pan with the flour, one with the egg mixture (add a few drops of Tabasco to the egg and water mixture), and one with the panko and cheese. Have a baking sheet ready, lined with parchment. Have a second one lined with a couple layers of paper towels, set close to the saute pan. Rinse and pat dry the pork. Place one chop into a gallon sized zipper top bag. Using a mallet, gently pound one chop at a time down to about 1/4 of an inch. you want them thin enough to cook within 1-2 minutes per side. After pounding, season each chop with salt and pepper. Dredge each chop in the flour and shake off the excess. 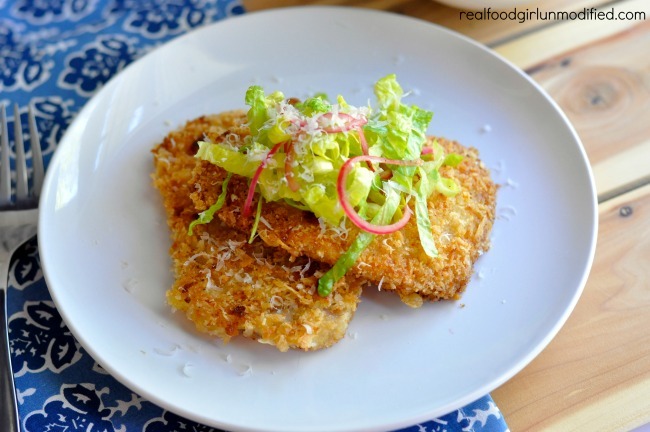 Dip it in the egg mixture, then into the panko and press the bread crumb-cheese mixture into each chop. Lay the breaded pork on the prepared baking sheet and set aside. Pour about 1/4 inch of your choice of fat into a large saute pan and bring to a medium-high heat. Test to see if the oil is hot enough by sprinkling (carefully) a few bread crumbs into the oil. They should sizzle. If they don't- wait. Once the oil is hot, add the pork and work in batches so you don't crowd the pan. Cook the first side of the pork until you start to see that the edges are cooked and it is golden brown and crispy. About 1-3 minutes tops. Turn and brown the other side. When the pork is done, lay it on the paper towels to drain, sprinkle with a tiny bit of salt, then keep the pork in the oven while you cook the second batch. Before serving, spritz each piece with the juice from a small wedge of lemon. If you've made the salad and the pickled onions, you can put that on top of each piece of pork or serve it along side. This looks so good. I don’t eat pork often but this looks like a great way to make it. The pickled onions look great too. Thanks. This looks delicious Kristine. The pickled onions would really make this dish and I can’t wait to try them. Sorry to hear you’re allergies have you down. My were awful last week and I wasn’t able to think, much less write a thing. Great recipe and post.